As more and more enterprises are hosting their applications in cloud and are relying more on SaaS and PaaS applications to provide services, they are increasingly becoming dependent on multiple external applications and the networks in between. The traditional network monitoring tools work in silos and do not provide end-to-end visibility. Therefore, if an application is found to be running slow, it becomes difficult to identify whether the problem is because of your network, the service provider or the application. Network Performance Monitor (NPM) introduces Service Endpoint Monitor that integrates the monitoring and visualization of the performance of your internally hosted & cloud applications with the end-to-end network performance. You can create HTTP, HTTPS, TCP and ICMP based tests from key points in your network to your applications, allowing you to quickly identify whether the problem is due to the network or the application. With the network topology map, you can locate the links and interfaces experiencing high loss and latencies, helping you identify external & internal troublesome network segments. 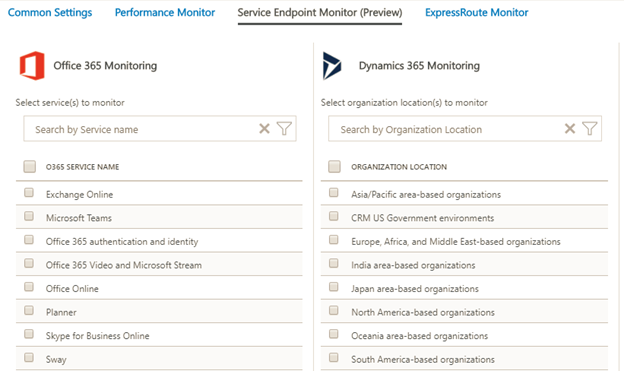 Service Endpoint Monitor monitors total response time, network latency and packet loss between your resources (branch offices, datacenters, office sites, cloud infrastructure) and the applications you use, such as websites, SaaS, PaaS, Azure services, File servers, SQL etc. By installing the NPM agents at the vantage points in your corporate perimeter, you can get the performance visibility from where your users are accessing the application. You can setup alerts to get proactively notified whenever the response time, loss or latency from any of your branch offices crosses the threshold. In addition to viewing the near real-time values and historical trends of the performance data, you can use the network state recorder to go back in time to view particular network state in order to investigate the difficult-to-catch transient issues. The capability plots both the response time as well as the network latency trends on the same chart. This helps you easily correlate the application response time with the network latency to determine whether the performance degradation is due to the network or the application. The following snippet demonstrates one such scenario. The chart shows a spike in the application response time whereas the network latency is consistent. This suggests that the network was in a steady state, when the performance degradation was observed - therefore, the problem is due to an issue at the application end. The example image below illustrates another scenario where spikes in the application response time are accompanied with corresponding spikes in the network latency. This suggests that the increase in response time is due to an increase in network latency, and therefore, the performance degradation is due to the underlying network. Once You’ve established the network to be the problem area, you can then use the network topology view to identify the troublesome network segment. NPM’s interactive topology view provides end-to-end network visibility from your nodes to the application. 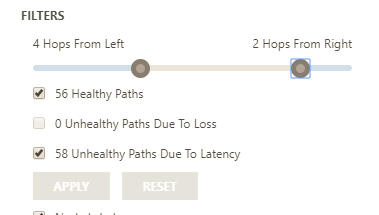 You can not only view all the paths and interfaces between your corporate premises and application endpoint, but also view the latency contributed by each interface to help you identify the troublesome network segment. The below example image illustrates one such scenario where most of the latency is because of the highlighted network interface. 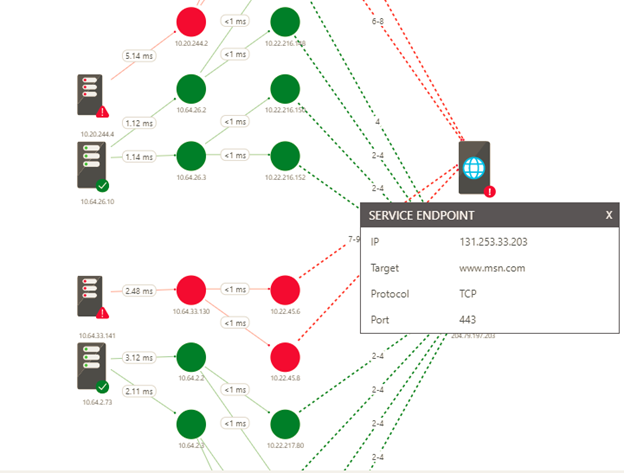 The below example image illustrates another scenario where you can get the network topology from multiple nodes to www.msn.com in a single pane of view and identify the unhealthy paths in red. When you are using external services such as Office 365, several intermediate hops will be outside of your corporate network. You can simplify the topology map by hiding the intermediate hops using the slider control in filters. You can also choose to view only the unhealthy paths. NPM provides built-in tests that monitor connectivity to Microsoft’s Office 365 and Dynamics 365 services, without any pre-configuration. The built-in tests provide simple one-click setup experience where you only have to choose the Office 365 and Dynamics 365 services you are interested in monitoring. Since the capability maintains a list of endpoints associated with these services, you do not have to enter the various endpoints associated with each service. All data that is exposed graphically through NPM’s UI is also available natively in Log Analytics search. You can perform interactive analysis of data in the repository, corelate data from different sources, create custom alerts, create custom views and export the data to Excel, PowerBI or a shareable link. You can find detailed instructions about how to setup Service Endpoint Monitor in NPM and learn more about the other capabilities in NPM. UserVoice: Post new ideas for Network Performance Monitor on our UserVoice page. Join our cohort: We’re always interested in having new customers join our cohorts to get early access to new features and help us improve NPM going forward. If you are interested in joining our cohorts, simply fill out this quick survey.